Usenet is built on two major concepts: Completion, the percentage of files available on Usenet, and the speed at which you can gain access to these files available. Usenet is definitely worth a look if you’re interested in easy and fast file downloads. Usenet is a wonderful service for downloading movies and all kinds of other content. Usenet is very diverse. NewsHosting is our favourite Usenet access since Newshosting is well adapted to the new Usenet network and to its users' expectations: Best Completion and Ease of use. Many of the files you’ll find on Usenet are “obfuscated”. These stealth files have obfuscated names in order to hide their content and these releases improve your completion rates. Newshosting offers the best completion rates on the market, thanks to Obfuscated files. 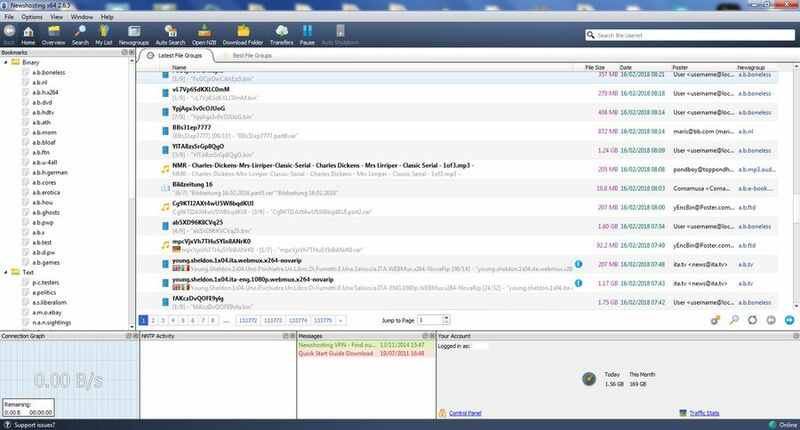 With access to Obfuscated files, you’ll be able to find whatever you’re looking for. NZBGeek: NZBGeek is a Newznab based site. NZBGeek impress us with its deobfuscation abilities. NZBPlanet: Great quality of releases. NZBFinder: NZBFinder is a fantastic NZB indexer with smart deobfuscation. NZBGrabit.XYZ: NZBGrabit is one of the most reliable index source. If you have a fast Internet connection and Usenet provider such as Newshosting, you can download at full connection speed. The is the major reason why downloads via Usenet are becoming increasingly popular. Newshosting can provide Usenet content as fast as your internet connection can take it. NewsHosting’s Usenet browser is super easy to use and makes using newsgroups easier and faster. Newshosting’s Usenet browser offers two excellent features for Usenetters: global search and NZB integration. You also can just open an NZB file directly, the Newshosting client immediately starts downloading it. Full download speeds are instant. NZB files make accessing files on Usenet extremely easy. Newshosting can make your downloads automatic thanks to its new option New autosearch in the Newshosting browser. This function doesn't has the same capacities as Couchpotato or Sonarr but is largely sufficient. The automatic search also decrypts obscutated files. You can use headers to see all available posts in a Newsgroup instead of using NZBs to download only specific ones and discover rare files. Downloading and browsing Usenet headers is the oldest method of browsing the newsgroups. Uploaders more and more often put an image file in their post. The Newshosting Newsreader has this image appear in the Header. So an obfuscated file could appears thanks to the image. Conclusion: Newshosting is offering excellent completion, speeds, and ease of use at very reasonable prices. If that wasn’t enough already then you’ll be glad to know that Newshosting also provides strong security and enormous retention periods. In fact, Newshosting has the longest data retention periods of all the big Usenet providers.